Four residential historic districts encompassing nearly 500 significant buildings are found throughout Lynchburg's downtown. Located on a ridge above the James River, Daniel's Hill Historic District is a residential neighborhood that displays a variety of 19th-century architectural styles. 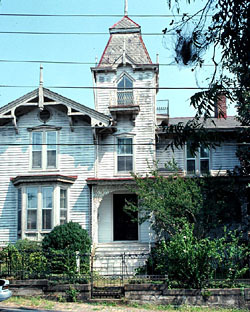 Concentrated building activity began in the 1840s after the subdivision of the Cabell-Daniel family plantation whose mansion, Point of Honor, forms the neighborhood's focal point. Cabell Street, the district's main street, is lined with a progression of mid- and late 19th-century mansions, all solid examples of their respective styles. Particularly interesting is the Y-shaped dwelling at Cabell and B streets, built in 1875 by architect Robert C. Burkholder as his residence. More typical is the 1853 to 1854 Greek Revival Dabney-Scott-Adams House at 405 Cabell Street. Another Greek Revival landmark is Rivermont, a frame mansion. Contrasting with these high style dwellings are the vernacular workers' houses scattered along the back streets. Protected by historic zoning, the district is undergoing slow rehabilitation. 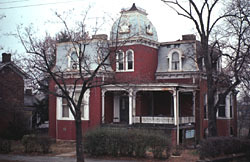 Immediately south of downtown Lynchburg, the Diamond Hill Historic District was once one of the city's most prestigious residential neighborhoods. 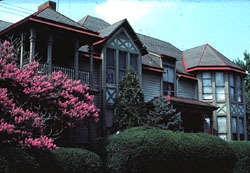 Its development began in the 1820s, and it enjoyed its greatest popularity at the turn of the century, which was marked by the construction of numerous large residences, ranging from speculative rental units to stately architect designed houses usually in the Queen Anne or Georgian Revival styles. The family homes of businessmen and civic and political leaders were clustered along Washington, Clay, Pearl and Madison streets, with Washington Street the most prestigious address. Especially interesting is the Queen Anne style residence at 1314 Clay Street designed by architect J. M. B. Lewis as his residence. After a significant decline, Diamond Hill in recent years has experienced considerable preservation activity. Building in Lynchburg occurred on its several hills--one of the earliest and most distinctive historic districts lies on Federal Hill. The Federal Hill Historic District served primarily as a residential area favored by merchants and civic leaders. Spread through the district's dozen blocks is an assemblage of freestanding dwellings in architectural styles popular from the early 1880s through the early 1900s. Most significant are the neighborhood's early Federal houses, which include some of the oldest and finest dwellings in the city, among them the Roane-Rodes House on Harrison Street (built around 1816) and the 1817 Norvell-Otey House built on Federal Street for banker William Norvell. Several other early Federal houses, including the Micajah Davis and Gordon houses, built before 1819, are scattered along Jackson Street. This area was incorporated into Lynchburg through annexations in 1814 and 1819. Another historic district that sprang up on Lynchburg's hills is the Garland Hill Historic District. Named for Samuel Garland, Sr., a local lawyer who was among the area's first residents, Garland Hill remains perhaps the best preserved of the prosperous neighborhoods that sprang up in Lynchburg during the 19th century. The hill, subdivided into approximately 10 blocks in 1845, built up slowly, so that it now has a rich mixture of freestanding houses representing styles in vogue from the 1840s to World War I. The grandest dwellings line Madison Street. At its eastern end are two large Queen Anne residences: the 1897 Frank P. Christian House and the 1898 George P. Watkins House, both designed by Edward G. Frye. The most impressive building is the huge Ambrose H. Burroughs House of 1900, a castle-like dwelling designed by J. M. B. Lewis. Because there are no through streets, an air of quiet dignity still pervades the district. 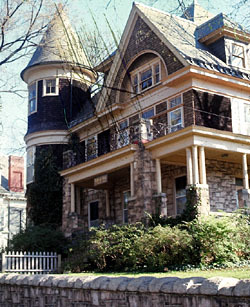 Daniel's Hill Historic District is roughly bounded by Cabell, Norwood, Hancock and Stonewall sts. from 6th St. to H St. Diamond Hill Historic District is roughly bounded by Dunbar Dr., Main, Jackson and Arch sts. Federal Hill Historic District is roughly bounded by 8th, 12th, Harrison and Polk sts. Garland Hill Historic District is roughly bounded by 5th St., Federal Ave. and the Norfolk Western RR tracks. Walking/driving tour brochures for Lynchburg's Residential Downtown Historic Districts can be obtained from the Lynchburg Regional Convention and Visitors Bureau, at 12th and Church sts., open daily from 9:00am to 5:00pm. Please call 434-847-1811 for further information. Lynchburg Historic Tours also offered guided tours of the districts, for a fee; call 434-846-1868 or visit the website for further information on these tours.